Week two of Middle Georgia Basketball Academy’s Fall Madness League intensified as it featured five solid matchups. Like last year, eager mid-state prospects battle it out each Saturday in preparation for the upcoming school ball season. Hypesouth Media continues its coverage and gives you the rundown from centercourt. MH Elite cruised for the majority of the game, but took its foot of the gas in the second half allowing Bostic Next Level to make things interesting late. Camrone Cherry led the way with 11-points as MH Elite escaped and Ethan Abbott pumped in a game-high 30-points including five trifectas in a losing effort for BNL. 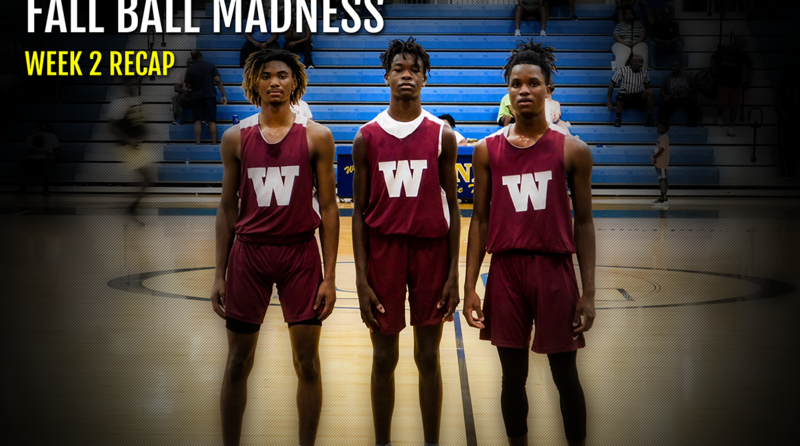 Westside-Macon returns a quartet of backcourt players from last year’s Final Four squad and it shows. Seniors Jonta Balkcom and Des Foston (pictured-right) are the junkyard dogs of the bunch while sophomores Javian Mosley (pictured-left) and Kowacie Reeves Jr. (pictured-center) handle most of the scoring duties. Westside flustered Southwest from the outset with its defensive intensity and the game was never in question. Reeves Jr. led all scorers with 21-points and Mosley threw in 10-points, six rebounds, and four assists in the blowout win. Tyeem Mason fought hard for the Patriots collecting 11-points, five rebounds, and two blocks. Jones County used a complete team effort to take down Howard. Almost every Greyhound player got into the scoring column with Marquis Jackson (10-points 2-assists), Bryson Wooten (8-points 4-rebounds), and Chavis Mathis (8-points 6-rebounds) leading the way. On the other side, Collin Tarver had 21-points and Kelvin Burrell chipped in 11-points and five rebounds for the Huskies. Antonio Card was a bright spot for Central-Macon tallying 17-points which accounted for half the offensive production. Harold Thompkins helped with 9 points and 7 rebounds in the win for the Chargers. Dee Morton scored 9-points for an inexperienced Mary Persons crew. The guard play of Middle Georgia Elite proved to be too much for Tattnall. Ty’Ree Gilbert racked up 17-points, Darius Dunn added 13-points, Jordan Stephens had 11-points, and Kendall Green pitched in 8-points in the win for MGE.